Do not allow the Church or State to govern your thought or dictate your judgment. we got back into town yesterday (4:30 am to be exact) after a wonderful mini-vacation in new york city. the purpose of our trip was two-fold - a postponed celebration of f & my 30th anniversary and to attend p's surprise 50th birthday party on saturday evening. with the exception of not having the opportunity to visit any blogging buds, the trip was pretty close to perfect. we spent part of friday at the metropolitan museum of art, we went specifically to check out the pierre bonnard exhibit. I love bonnard's focus on everyday life and his incredible use of color. other highlights of the met were the postcard collection of walker evans, the photography exhibit truth and illusion, and encountering jules bastien-lepage magnificant painting joan of arc. (by the way, there's a snap of this painting on my march 13 flickr set). after viewing the works of bonnard and bastien-lepage, perhaps we had france on the brain. with hours before dinner and rumbling tummies, we made our way to artisanal and treated ourselves to a glass of wine and a delightful array of cheese. our light repast at artisanal was the first of many incredible food experiences during this visit to new york. friday evening we joined p&k and checked out matilda, a relatively new restuarant which serves up a delicious fusion of mexican and tuscan cuisine. along with having wonderful food, maristella and esteban, matilda's chefs and owers, are just about the nicest folks imaginable. the restuarant itself is a feast for the eyes. if you are looking for a wondeful place to eat with reasonable prices, make sure you make your way to matilda! well, that's all the time I have today - as you might expect I took a hundreds of photos. I just started working my way through them. I've organized the first day's pictures into a flickr set for anyone interested. click here to view a slide show of our first day. 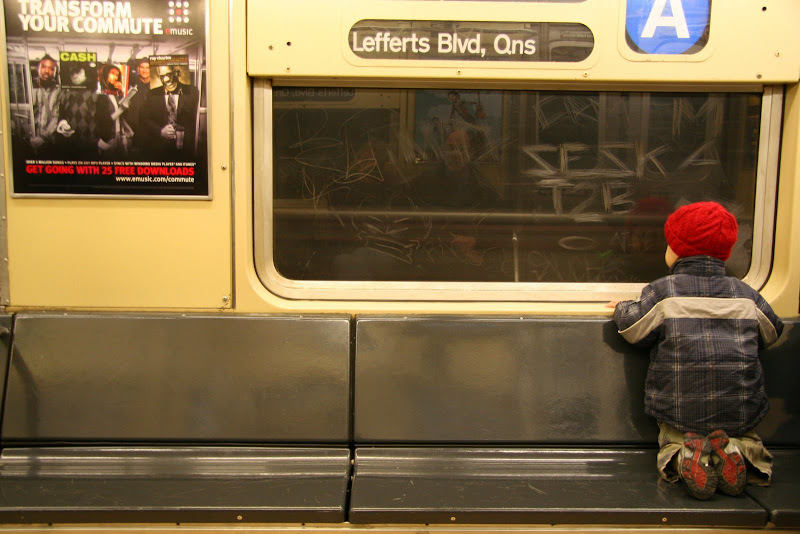 another herstory milestone for this day in history: first public celebration of bat mitzvah, for the daughter of rabbi mordecai kaplan, is held in New York City on 18 march 1922.
photo: looking out of the a train, new york, 13 march 2009. Welcome home! You were missed. And happy 30th to you both. Love the three shots of red in the photo - they really make the pic. Hurray to Matilda Joslyn Gage. Must read more about her. Congrats to Reb Kaplan. 1922 - can you imagine? Mary Hopkin - ah yes, doubt wasn't much on the agenda in 1968, neither in America nor here in France, either. Welcome back! I like your shots. I especially liked the one of the guy carrying the mannequin. My friend Arleen shoots street scenes like that (she has a whole series in Brooklyn) except she works in b&w. It looks like you guys had a great time in NYC! Oh, Kim. You made a perfect movie out of those photographs on the Flickr; there was some music on the radio that went perfectly while I was looking at them. What great individuals you found. That woman in the museum who you shot from above. Really, everything. I'm glad you had a great time. cheers! I really enjoy your blog, your photos New York, I love Bonnard!!! The west coast is just too far from the Big Apple.....though I did once live in Woodstock..Then we went to the city to see the Living Theatre...remember them? Glad you had a wonderful anniversary trip. Can't wait to see your photos. This one is outstanding. That child looking out the window looks ready to see something wonderful. I loved your slide show! It looks like a wonderful minivacation.